I truly believe that anyone can learn to play the violin! “Music is for everyone” is the fundamental idea fueling my philosophy. I am a passionate person and believe that anything can be accomplished when passion is involved. I am also very serious about practice. I strive to teach my students how to practice at home. Passion plus practice equals real results. I love music, I learn music, and therefore I dedicate my career to teaching music. I love teaching others how to play the violin. In my teaching career, fortunately, I have been highly rewarded by the outstanding performances of my students and the life-long relationships they have maintained with the knowledge they have learned in and out of our lessons. I strive to find music and various pieces that each student is passionate about. If you love fiddle music, then that is what you will play, if you love Bach, then Bach it is! Learning is easier if you love what you are playing. I have learned more than I expected in many aspects since I started to teach. I truly love what I do and take pride in seeing progress in my students and from making music together and having a wonderful collective experience. I look forward to seeing myself not only being a competent teacher, but also an effective learner who appreciates learning from working with students. Words can’t express how much I love music and sharing it with others, which is why I suppose music begins where words leave off. My primary goal is to teach students how to learn music and to love making it. Teaching must be matched to the students’ learning style, not matched to the teacher’s teaching style. Therefore, teaching style, curriculum, and approach must be flexible, varied, and individual. Empowerment and passion are the keys to motivation. Motivation is not something the teacher does to the student; it is something the student does to themselves. The teacher’s part is to introduce possibilities. If the student practices enough, I guarantee results. 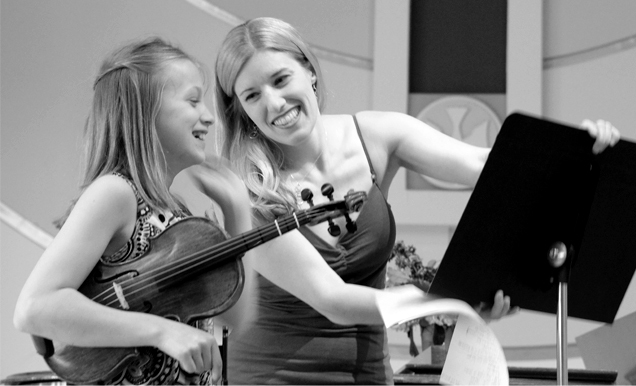 Music lessons should be fun and engaging. They are a privilege, not a punishment or requirement. If we’re not having fun, something is wrong. Violin study isn’t always going to be easy, but it should always be satisfying. There is a wide misperception is that beginner violinists all sound bad. Your violin should never sound “bad” or squeaky, if it does, then something is wrong and we will fix it together. I emphasize listening to music, and I will give you many CDs to listen to during the course of your lessons with me. The more music you listen to, the better your tone will get, and the more beautiful you will sound. I emphasize initiative and self direction. I encourage exploration and creativity. It is essential for me to discover what a student’s other interests are and what s/he wishes to learn about. We learn as human beings by connecting something we don’t know to something we already do. I work tirelessly to fix bad habits and don’t let my student’s get away with them. In the absence of bad habits, progress on the violin is a thousand percent faster, easier, and sounds better. If you are having a particular technical or musical problem, more than any teacher I know, I will make it a personal priority to find an exercise, piece, or bit of advice to solve the problem. If I can’t, I write my own music for you on my music writing computer program. I show my students respect and affection. A sense of humor makes everything easier in life; we will have many good laughs together during lessons. I work hard to teach new skills at every lesson, but this isn’t possible unless the student does their part and practices at home during the week. It is a waste of my time and the students’ money if they do not practice. I’ll never be angry if you ask a question. I’ll never be angry if you make a mistake. I’ll only be upset if you don’t try. If you won’t try, I can’t teach you. If you don’t understand something, it’s my fault, not yours. It’s my job to teach you in a way you understand. Attempting is often more important than succeeding.